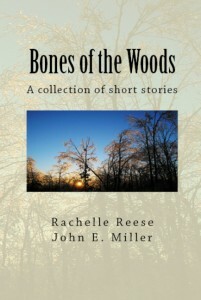 Bones of the Woods is a collection of eight short stories by Rachelle Reese and John E. Miller. The collection was inspired by two destructive storms that took place at their home in Missouri in 2006. The book includes stories from several genres, including science fiction, horror, dark fantasy, and urban fantasy. Bones of the Woods is available for Kindle or in paperback. The Bones of the Forest – When Amanda moves with her family outside the safety net, into the Undiscovered Foothills, she is fascinated by her new freedom to explore. But when she explores a crumbled old house, she finds a journal that makes her doubt the truth of everything she’s ever been told. Read an excerpt. The Hangman’s Tree – When a young man decides he’s had enough of life, Death decides its time to retire. But before he does, he recounts a tale of how he came to yield the noose and what he did with it. Read an excerpt. His Last Shot – Lance Corporal is a successful assassin. But when his grandfather dies, he finds himself sitting alone in a diner, thinking about the events that made him Coldshot. Read an excerpt. Immortal – Dr. Feldman is well-known for his ability to treat difficult cases. But when James Ryan takes his seat in the patient’s chair, Dr. Feldman begins to doubt his safety…and his sanity. Read an excerpt. In the Air Tonight – In this futuristic science fiction thriller, a visit to an arcade sets in motion events that can never be undone. Read an excerpt. The Leaf Man – Civilization is encroaching on the forest where Rebecca and her husband Jerry live. Jerry is ready to take advantage of the rising real estate prices, but Rebecca has other worries when a mysterious man begins to haunt her paintings and her life. Read an excerpt. The Protectors – The coyote’s howl confirmed her fears. Another soul had passed before rising. Another protector had been taken. A cold hand tore at Sylvia’s chest. Another howl, and then another. Birds screeched mercilessly. The ducks were in an uproar. In that moment, Sylvia knew the death had not been kind. The soul had not been freed. Read an excerpt. The Thaw – A large part of Carol’s childhood is blank. Some nights she is haunted by dreams of being frozen alive and only building a large fire can calm her down. When her husband convinces her to see a psychiatrist, some memories begin to emerge that disturb Carol and make her think she’s going insane. Either that or Finger Fear is real. Read an excerpt.